The progeny of 2001 Arlington Million (gr. I) winner Silvano dominated the finish of the 2015 Vodacom Durban July (SAf-I) July 4 at Greyville Racecourse in South Africa. Silvano sons Power King, Punta Arenas, and Tellina ran 1-2-3 to give their sire, South Africa’s champion sire in 2012-2013, the trifecta in the R3.5 million race. It was also a case of a winning trifecta for breeders Maine Chance Farms, which stands Silvano. The Robertson, South Africa nursery also stands Silvano’s champion son Vercingetorix this season. 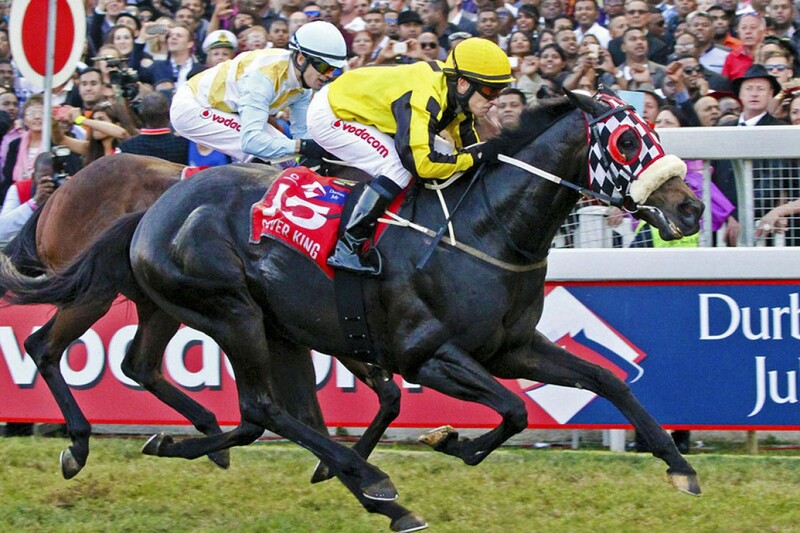 Power King is the third Durban July winner for Silvano, with the Lomitas son having previously been represented by Bold Silvano and Heavy Metal, victorious in 2010 and 2013, respectively. Power King was allowed to jump a 22-1 shot for the July, with star 3-year-old Legal Eagle sent out as favorite, following three wins on the trot culminating in a visually impressive romp in the group III Jubilee Handicap at Turffontein. One of five runners in the race for leading trainer Sean Tarry, Legal Eagle had also previously scored in the SA Derby (SAf-I) and looked a tough nut to crack Saturday. The 18-horse field got away with outsiders Helderberg Blue and Deputy Jud among the first to show the way. Legal Eagle raced close to the pace early on, but battled to find a clear run later on in the running, with his stablemate Halve The Deficit another to suffer interference in the closing stages. Power King, coming off a close second in the group II Betting World1900, came with a storming run down the middle of the field, and kicked clear. However, longshot Punta Arenas came with an equally determined challenge down the outside. With Power King drifting in, he bumped Punta Arenas twice in the final 150 meters, before drawing off to post a three-quarter-length over his paternal half brother. Tellina, fourth in the Durban July in 2014, ran on for third, beaten 1 1/4 lengths, with Futura another length away in fourth. For the second year in a row, the Durban July saw an objection. Jockey Ian Sturgeon laid an objection on behalf of his runner-up Punta Arenas, against the winner. However, the objection was eventually overruled and the result was allowed to stand. The gelded 4-year-old Power King provided jockey Stuart Randolph and owner Lady Christine Laidlaw with their first wins in the Durban July. He was the third July winner for trainer Dean Kannemeyer, who had previously triumphed with Dynasty and Eyeofthetiger in 2003 and 2006, respectively. Out of the Northern Guest mare Northern Gale, Power King’s win on Saturday pushed his record to six wins and nine placings from 18 outings. The winner of both the Winter Guineas and Winter Classic (both SAf-III) last season, Power King has amassed prize money of over R2.8 million in stakes.